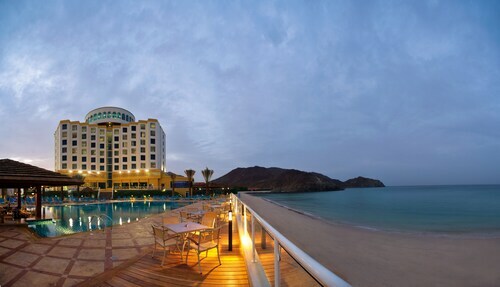 Nestled on the beach, this Khor Fakkan hotel is 0.4 mi (0.6 km) from Khor Fakkan Beach and 5.9 mi (9.4 km) from Al Badia Mosque. Port of Fujairah and Wadi Stone Village are also within 20 miles (32 km). Great place. A bit expensive inside but a very good experience. Ylellinen mutta erittäin kallis hotelli. Aamupalastakin piti maksaa erikseen. Alue on vasta rakenteilla, joten hotellin ympäristö oli työmaata. 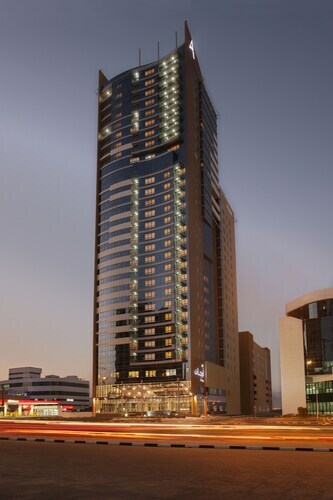 Located in the heart of Al-Fujairah, this hotel is within a 10-minute walk of Lulu Hypermarket and Sheikh Zayed Mosque. Fujairah Museum and Fujairah Mall are also within 3 miles (5 km). 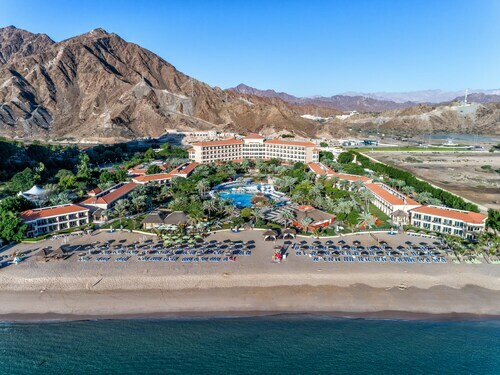 So, you're thinking about a trip to Khor Fakkan? If you'd like to find accommodation that's located close to the sights, you can enter your holiday dates and then use the filters next to your hotel search results to find a hotel near the area's attractions. When you're thinking about where you want to stay in Khor Fakkan, you can easily and quickly search ebookers for hotels that offer services such as high-speed Internet, free airport transport or a swimming pool. You can take advantage of the filters to narrow down your hotel search, so you can get the services that are important to you, such as air conditioning or an in-room kitchen. 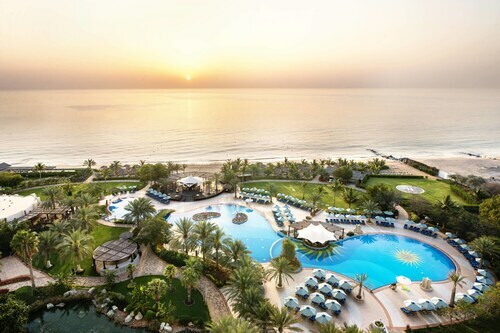 When arranging your Khor Fakkan getaway, you can also use ebookers to search for a convenient flight into Ras al Khaimah (RKT-Ras al Khaimah Intl.) Airport. You can narrow down your search by number of stops, airline or time of departure to identify one that'll meet your needs. When is the Best Time to Explore Khor Fakkan? If you're curious when is the best time of year to explore Khor Fakkan, you may find this information about seasonal weather helpful when you are organising your getaway. The warmest months in Khor Fakkan are typically July and June, whereas the coldest months are usually January and February. The months with the most rain are February and January, whereas December and February have the least. From January to March, the average daytime temperature is 31°C and at night it is 12°C. Seasonal average rainfall is 3 mm. The average annual rainfall in Khor Fakkan is 3 mm. 4 years ago by Gerhard H.
The hotel is nice but out in the middle of nowhere with building sites practically on each side. We had a lovely room with a balcony but the smell in the mornings that wafted into our room was not a fresh sea breeze, there were obviously sewage problems. Tennis courts, Gym & Spa were all lovely and we had excellent full body massages. However the staff at the beach & pool bar/ restaurants were incredibly slow. We had to go get our own drinks and carry them back to our seats each day. The food was average. Nearest town 1hour away. Had to leave a day earlier as otherwise we would have been up at 3am to make our connections in Dubai at 6am & flight at 9am from AbuDhabi. Too far to go again but maybe in 3/5years when all the new hotels are finished building it might be worth a 2nd trip. 4 years ago by Elaine B. Hotel was good, they gave me an upgrade to a 2 bedroom suite which had great views and was very comfortable. Swimming pools and general amenities were good. The down side was the hotel has a large number of Russian and Eastern European holiday makers on all inclusive packages so meal times were very busy as the hotel only has 2 restaurants. The hotel made a mistake with the booking and booked 2 rooms for me which I think is how I got the upgrade they then argued that I had to pay for 2 room although I showed the ebooking reservation confirmation showing only one room. I eventually left after paying for only one room but with them saying they would get in touch with me. So although the stay was good it was marred by the 2 days of arguing with the front desk personnel about the additional room.